Recently, two extrastriate visual areas on the posterior fusiform gyrus, areas FG1 and FG2, were identified based on cytoarchitectonical criteria (Caspers et al. in Brain Struct Funct 218:511–526, 2013a). They are located within the object-related ventral visual stream at the transition between early and higher-order (category-specific) visual areas. FG2 has a topographical position which is best comparable to the face or visual word-form recognition area. However, the precise function of FG2 is presently unknown. Since transmitter receptors are key molecules of neurotransmission, we analysed the regional and laminar distribution of 15 different receptor binding sites by means of quantitative in vitro receptor autoradiography. Significant differences between receptor densities of both areas were found for NMDA, GABAB, M3, nicotinic α4/β2 and 5-HT1A receptors as well as for GABAA associated benzodiazepine binding sites. These results support the cytoarchitectonic segregation of FG1 and FG2 into two distinct cortical areas. In addition, principal component and hierarchical cluster analyses of the multireceptor data of both fusiform areas and 24 visual, auditory, somatosensory and multimodal association areas not only revealed the typical receptor architectonic characteristics of visual areas for FG1 and FG2, but also suggest their putative function as object recognition regions due to the similarity of their receptor fingerprints with those of areas of the ventral visual stream. Furthermore, FG1 and FG2 build a cluster with the multimodal association areas of the inferior parietal lobule. This underlines their hierarchically high position in the visual system of the human cerebral cortex. This work was supported by the Initiative and Networking Fund of the Helmholtz Association within the Helmholtz Alliance on Systems Biology (Human Brain Model to K.Z. ), the DFG (IRTG 1328 to K.A. 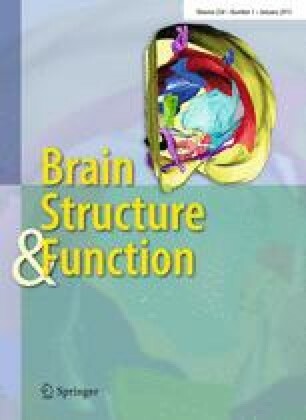 ), the Human Brain Project (WP2.1: multi-level organisation of the human brain, T2.1.1: distribution of receptors in the human cerebral cortex to K.Z. and K.A. ), and the Helmholtz Alliance for Mental Health in an Aging Society (HelMA to K.Z. and K.A. ).